And the following version 2.6.0.90 update registration code, please contact us (please send your original registration code). Download files up to 300% faster. Cut down more than half of the download time of Flash videos, movies, songs etc. It accelerates not only streaming on YouTube/Hulu/MySpace/Fox/Google and other streaming sites, but also normal file(iso, rar, exe...) downloading. It's the easiest way to get tons of free and legal music. The limitation is just your hard disk. FLV Downloader. SpeedyiTunes automatically record flash while viewing. 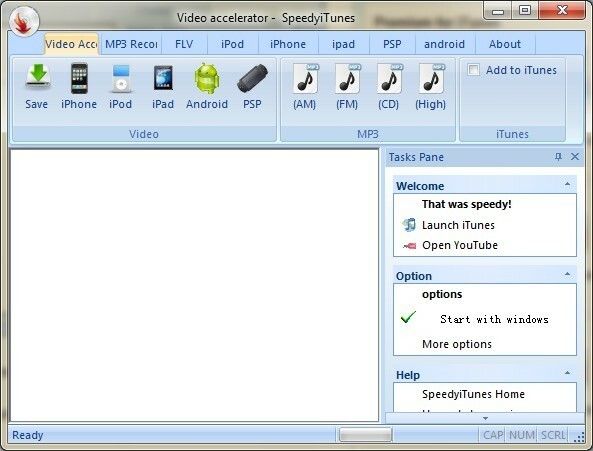 SpeedyiTunes is also a video converter. 1-Click to download and convert YouTube/FLV video to iPod/iPhone/PSP/MP3 and add it automatically to your iTunes library. Just Download, Install, Run. Your downloads will be accelerated automatically. Nothing more! 1-Click video converte, MP3 record and iTunes import. 100% free of viruses, spyware, adware any kind of malware. SpeedyiTunes is the easiest solution to get entertainment media free, fast & legal. Warning: There's an issue between SpeedyiTunes and Nod32 2.7 because they use the same network technology. Latest Nod32 3.0 and ESS don't have this problem. Speed up iTunes Movie/TV downloads up to 10X times faster. Convert YouTube/Flv video to iPod, iPhone, PSP and import it to iTunes library. Copyright © 2006 - 2019 SpeedyiTunes. All Rights Reserved.